I took a data class with The Seattle Times' data reporter Justin Mayo. He was and still is a truly fantastic mentor and from him I learned how to use the ever-so-handy Microsoft Excel to create infographics based off of loads of data, how to tell if there's dirty data, and how to make it so Excel comprehends what you want it to in order to discover information. Mayo also taught us how to take that a step further into interactive graphics with Tableau. The example below was my final project for the class, given to us with complete free reign on whatever we wanted. We had to determine a topic ourselves, find the data ourselves, clean it ourselves, set it up, organize, and make make a cohesive not-overwhelming interactive. I chose to analyze how the federal budget was divvied out in Washington state over the past couple years. See where trends were going and which departments relied on the most federal dollars. I was particularly curious about this last part because of the Trump administration and its likelihood of slashing federal funds. CLICK ON THIS POST TO SEE THE VISUALIZATION (and mess around with it)! The selection tool at right lets you choose a branch (or not), which then changes both graphs. 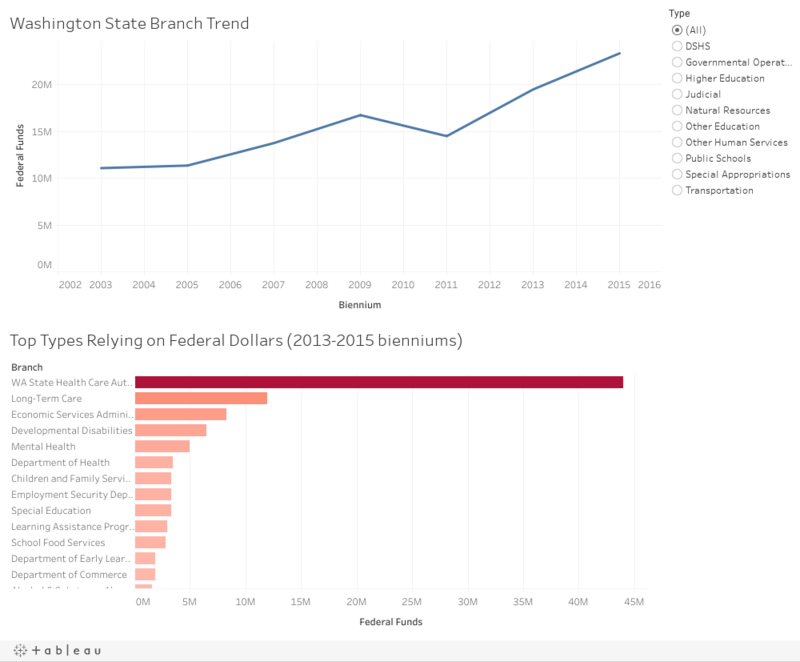 The upper graph shows you the general trend of money given to the branch since 2002, and the bottom graph breaks down how much each department within that branch got over the past complete biennium (2014-2015).